Valentine's Day is almost here and finding Valentine ideas to celebrate the day is not always easy. Valentine ideas range from cheesy to spectacular. 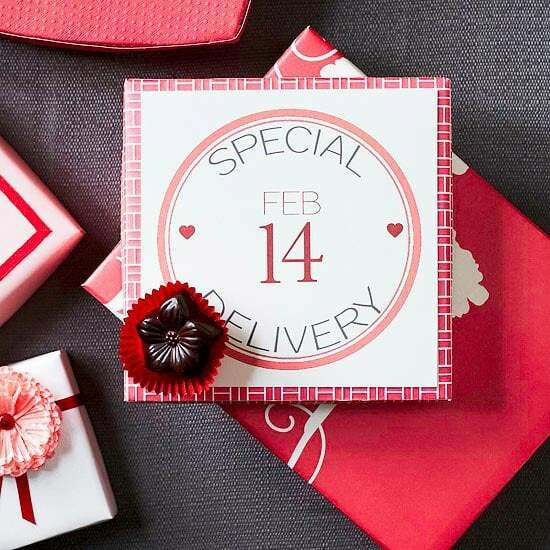 Flowers and lingerie of all shapes and sizes will be boxed, wrapped and delivered all over town, but for me the essence of the day is about celebrating the energy of love and welcoming more of it into our lives. Think beyond the romantic dinner. Crank it up a notch and remember people around you; from sweethearts to sisters, children to grandparents and darling, outrageous friends. Valentines is the time to give a loving thought and a thoughtful gift to those who touch your life.. as well as those who give lingerie. Here is a selection of cute Valentines Day ideas from home decor, table setting ideas, keepsakes and edibles with a full dose of simple homemade Valentine ideas. To me it's the friend I share secrets with and who listens no matter what (she knows who she is), my gorgeous sister who puts me straight and the postman who hands me my mail with a smile - every day. So pop the champagne, make a list of those you love, those who inspire you, make your days memorable and think about a thoughtful gift you can give to show them you care. Before I go on, if you prefer something more like a balloon ride, roller skating or salsa dancing, I haven't forgotten you; here are 10 Valentine's Day Ideas That Aren't Cheesy from Your Tango. But if you're all about the day and not the 'event', let's look at some things that could make this Valentines Day a great day to celebrate love in every form. How about we begin with something easy and downloadable? It's not home decor but it's fun and easy. Telling someone you love them can be as simple as leaving a few love notes around. It's a simple gesture we should do all the time, but do you? I know I don't. These gorgeous downloadable notes were created by Jones Design Company and can be found here in the latest February JDC. They are perfect for adding to lunch boxes, using as a gift tag or placing on the windscreen of a car. A computer, printer and some simple thick card is all you need. Emily at Jones Design Company is super creative and has a range of gorgeous downloads you can use as part of your Valentine's Day ideas. 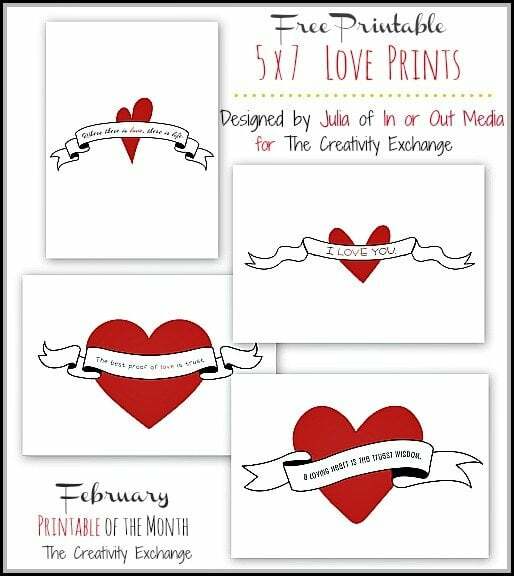 If you would like something a little larger to frame, or send as a postcard, then how about these homemade valentine ideas? These cute printables are from The Creativity Exchange. Five great 5 x 7 cards by Julia Roberts, a designer with an Etsy shop called InOrOut.Esty.com, created these especially for The Creativity Exchange and are found here. 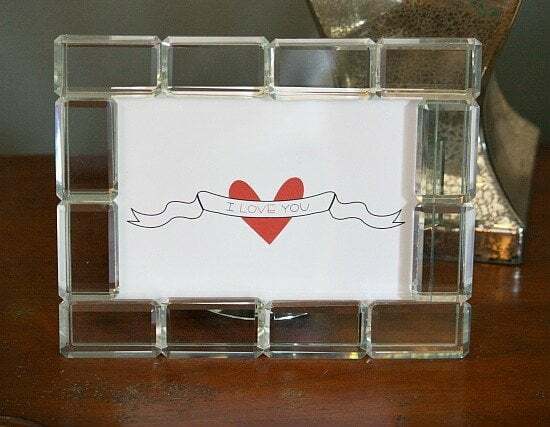 Framed, they become a thoughtful gift for anyone dear to you or to put on a side table. Mailed, they are a lovely keepsake; dated, signed and postmarked - an official document. Let Valentine's Day begin at home! Festive homemade valentine ideas such as a garland or banner over a fireplace, making heart shape biscuits, writing love notes or creating your own Valentine home decor for your home, table setting or office will help you enjoy the spirit of the day. 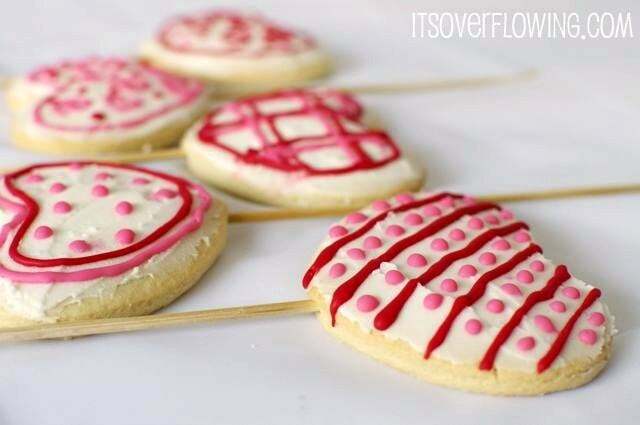 These Valentine Day ideas are fun and creative if you have time. These home decor ideas add color and the right amount of detail that says 'I care'. Better Homes and Gardens has 33 homemade valentine ideas and thoughtful gift ideas such as this heart made of vintage cotton spools and heart felt book marks below or the 'Be Mine Valentine' banner above. How you choose to show your love comes down to how well you know your Valentine and knowing what they will appreciate. After all, it's a gift of love that should thrill on many levels. If food is your medium consider the humble cupcake. 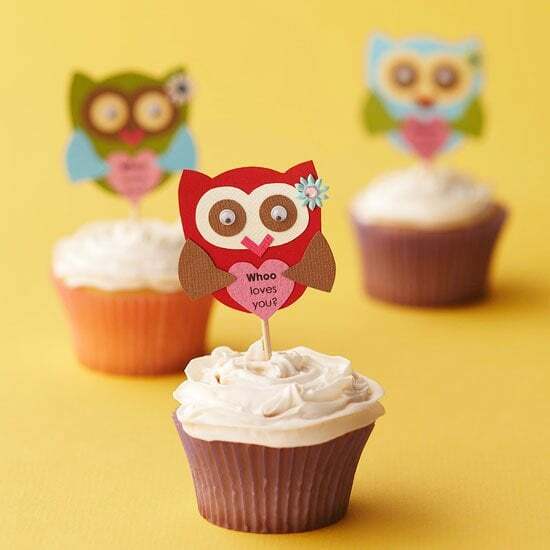 These gorgeous treats from Better Homes and Garden are cute Valentine day ideas and perfect to have with friends or give away. 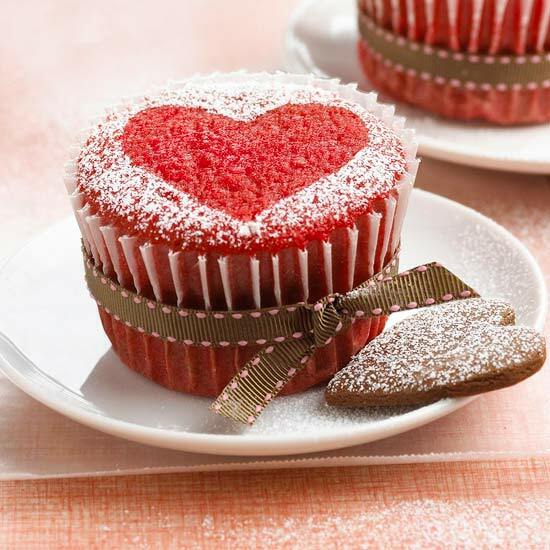 Treats like these Valentine cupcake treats are perfect to deliver or have as part of High Tea - Tea Party Etiquette – Etiquette and Menus Guide. It's a great opportunity to catch up with those you love but don't get to see as often as you'd like. Valentine's Day is often reserved for the big romantic dinner. Couples in love will squeeze into restaurants over a romantic dinner all around the world to honor and show their love. Other ideas? Why not have your romantic dinner at home or a picnic, a special breakfast or roof top cocktails? Why not leverage the whole idea and go beyond couples? Dinner for two or a dinner party for 12, Valentine's Day is for anyone who believes in love and wants to spread the word. 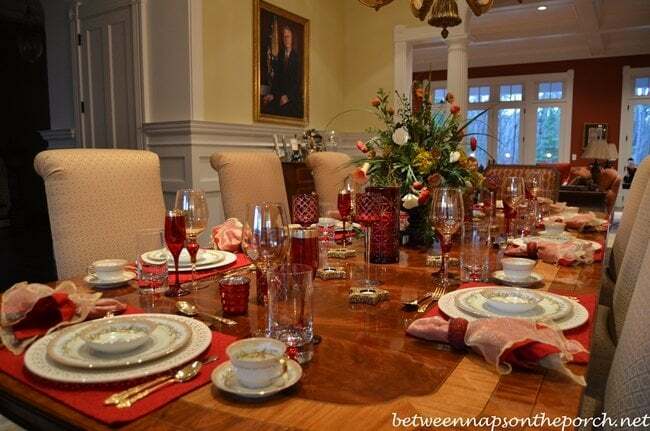 Organizing a Valentine's dinner is a great way to get friends together to celebrate friendship. Between Naps on the Porch have a great post on table setting for your Valentine's dinner you can find here. It's the Big Dinner Party. Read more here for the full-blown party with formal table setting, etiquette, seating and home decor ideas. 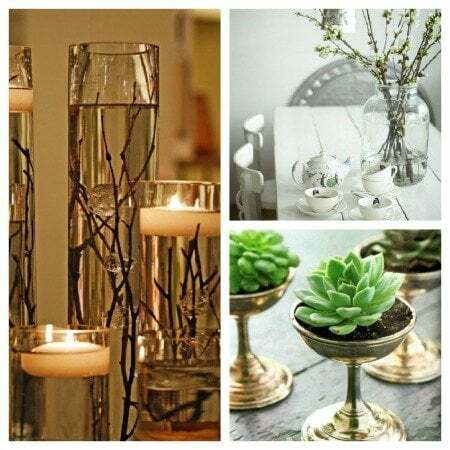 For a more relaxed table setting here are candle ideas, moss centerpiece ideas and vase and vintage silver planter ideas. If you need help with organizing your dinner menu Better Homes and Gardens have a selection of 32 Valentine dinners for any palate, budget and cooking skill. From Chicken Pot Pie to Asian Grilled Tuna, there is bound to be something here that you can whip up. Valentine day ideas come and go but celebrating with close friends over dinner is a thoughtful gift that will be remembered for years, so make the most of this one. Dressing your home for Valentine's Day is a great way to get into that loving feeling. 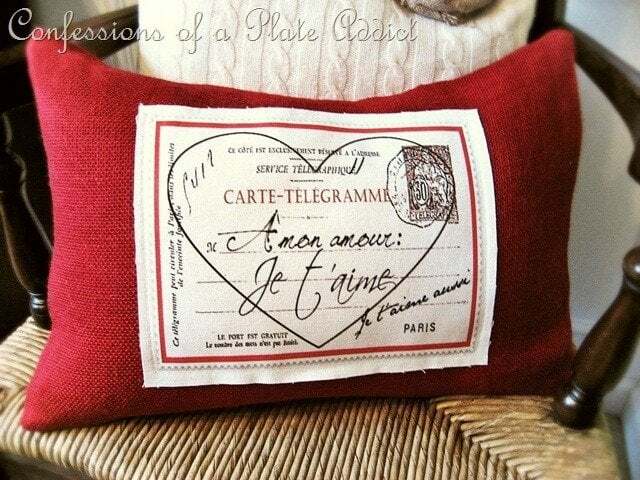 You can find these two homemade Valentine ideas at Better Homes and Gardens along with 23 other great home decor ideas! 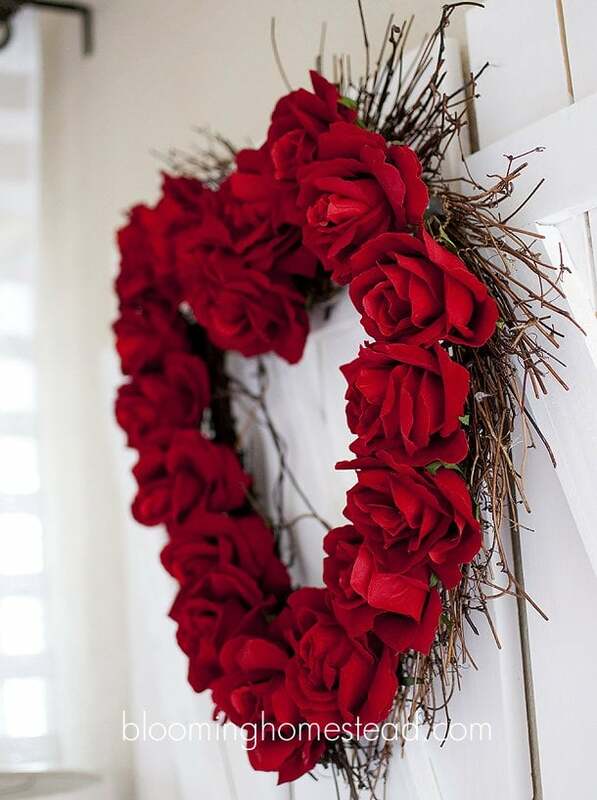 You can create wreaths, banners, keepsakes, and more like the simple Valentine decor idea above. 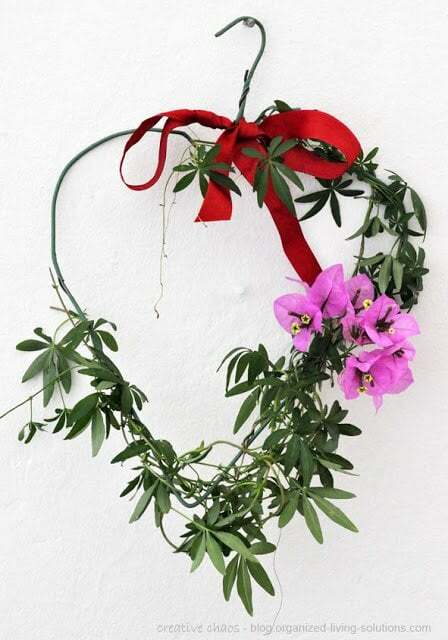 Or create something simple; this very cute wreath is little more than a green coat hanger, some greenery, pink blooms and a red ribbon from Creative Chaos. Find more thoughtful gifts like this here at Under the Table and Dreaming By Stephanie Lynn. Stephanie has put together over 25 great Valentine ideas for the home that you can make; from framed decor to edible treats. There are ideas for everyone. 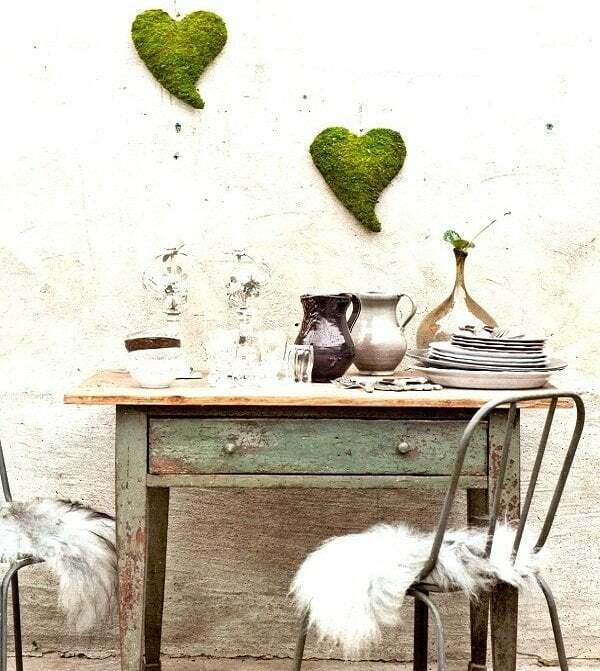 I love these moss hearts and metal hearts along with more great ideas from Splendid Willow found here. They are incredibly stylish and versatile enough to be used year round. Visit Splendid Willow to see how they use them as wall decor and for other cute Valentines Day ideas and gifts. No time for homemade valentine ideas? 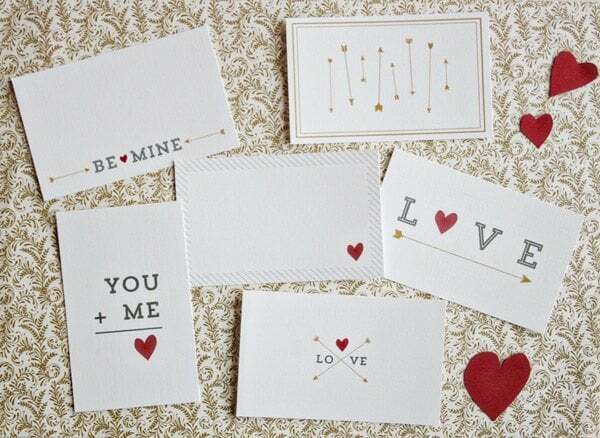 Then take a look at these cute Valentines Day Ideas from Design Sponge. The selection is huge covering clothes, kitchenware and jewelry; from Kate Spade tights covered in black and gray hearts to love straws and kitchen bowls with tiny colored hearts. 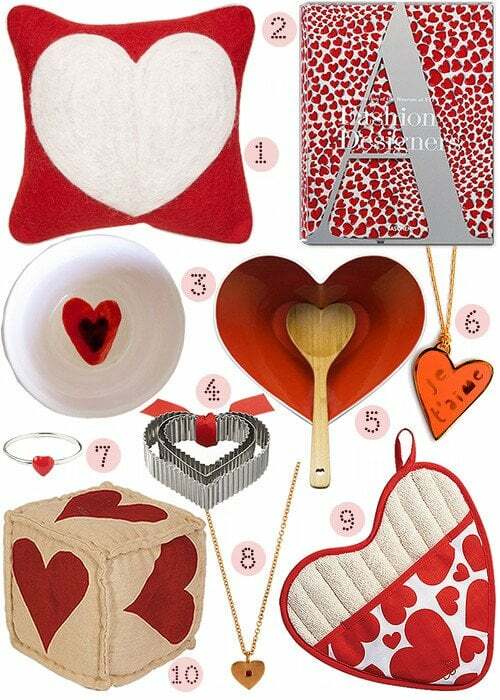 These cute Valentine Day ideas are thoughtful gifts for friends and useful presents for your home. You can also find some great ideas at Visi. Yes, it's all about the heart! So remember Valentines Day as a day to express love - to everyone. From the tiniest gesture to your romantic dinner, I hope you found these thoughtful gift big and small ideas inspirational to help you make your Valentine's Day full of joy and love. From homemade Valentines Day ideas, a romantic dinner or sweet treats, may your Valentine's Day be as sweet as it is long. If you haven't signed up for our Newsletter, sign up now and receive Interior Decorating Secrets as a thank you! Happy Valentine's Day! Love it, Christine. Valentine's Day doesn't seem so commercial and cheesy anymore. So pleased you liked it Jane.. Hope it spurs you to make, bake or date!